Candles are like pantyhose for your house: They make everything look good. I try to use candles as often as possible because they are the cheapest and most effective way to make mundane stuff seem special. I can’t get enough of them. Tuesday Meatloaf is no fun, but Tuesday dinner served by candlelight is a Rustic Celebration of Meat. FUN MUCH? …Watching a Movie is nice, but watching a movie on a comfy couch with a couple of lovely scented candles is a Cinematic Experience. THAT SOUNDS AWESOME!… Know someone who is having a rough day? Surprise them with a bowl of ice cream with a long stem sparkler candle. Just wait and watch a smile spread across their whole dang face. SHOW ME THE SPARKLER CANDLES! I made seven of these in under ten minutes using materials around the house. You can too! Thanks to candles, just about everyday this week is feeling like something pretty special! Birthdays, Labor Day, professional milestones, and the High Holidays are starting up…in fact, Rosh Hashanah (aka: Jewish New Year), starts today. Candles mark the beginning of every Shabbat dinner and play an important role in many Jewish celebrations. If you have any interest in learning any more about Jewish celebrations, or want to see someone weaving tradition, faith and creativity into everyday life, Creative Jewish Mom is the place to go! Check out her amazing Rosh Hashanah ideas. Regardless of your faith, I hope one day you will take the time to sit down to meal with your family, turn off the phones and every light in the house. Say a prayer as you light candles while your family watches and listens. Doesn’t need to be fancy. You could be serving a bucket of chicken to pack of screaming toddlers and the transformative power will be the same: you light the candles and they will sit down, shut their mouths, and listen up. When people see candles on the table they just know something special is about to happen. So, today, in honor of all our everyday celebrations, I present my most favorite art project ever: Melted Crayon Luminaries. I love these. You will too. Cheap, easy, effective, and best of all, anyone, regardless of age or skill level can take the lead in a step of the creative process. This is a simple variation on the ‘melt your crayon shavings’ craft we all did in Kindergarten. If you didn’t melt your crayon shavings as a kid, you need to stop what you’re doing right now and check it out! 3. Layer two: Use the knife the scrape little shavings all over the bag. Don’t even attempt to control where the shavings land. It won’t work. 4. Place wax paper on top of the shavings and use a low/no steam iron to melt/flatten the layer the layers together, checking constantly. Mine took about ten seconds. Lift off wax paper and prepare for the “ooooos and awwwwwe” ‘s! 5. Give the wax a minute to dry, then punch some holes in sides for extra sparkle. 6. Slip a candle* inside, stand back and admire! *Note on candles: For indoor use, I like to use a 10cent votive candle inside a plastic cup. If you are using these outdoors, I suggest you use jars or something made of glass (you don’t want a wind just to blow your candle flame to the side and set something on fire now, would you? )…you can also use those little battery powered LED light doo-dahs, but I think it’s hard to beat old-fashioned candle flicker. Try it for yourself! Wax is Wax. Don’t restrict yourself to old crayon stumps! You can also take shavings from old candles and get some really lovely, soft colors. They smell nice too! For more intense colors, try melting oil pastels from the art supply store. Wax paper bags are awesome. It’s difficult to find them, but some grocery stores around here carry them on the bottom shelf, near the generic aluminum foil. They are gorgeous. All pale brown and fabulous.You can melt the crayon shavings between two bags and get some amazing results! Semi-Related-Project-Tangent: Next Halloween, make spooky luminaries by using a black Sharpie marker to draw a spider web on wax paper bags, then wrinkle up the bag and slip in a jar with a candle –soooooo easy and they look fabulous. Incorporate the written word. For layer one, instead of scribbling randomly, choose a darker color crayon and write your guest’s name: TA DA! You now have a glowing place card! Or, write a message like “Happy Birthday” or even meaningful quotes or prayers. Just be sure your lettering is large enough that it will still be readable when it melts a little. Also, press HARD –you want layer two to melt much faster than layer one, so really push the wax into the paper. Subtle differences will pay off in the end. What about printed materials?! 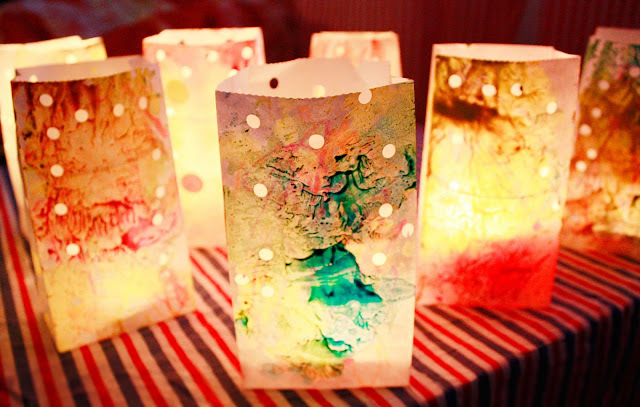 Swap out the first layer of scribbles for some scraps of patterned tissue paper. Anything translucent will do the job nicely Another-Semi-Related-Project-Tangent: What about a wedding or rehearsal dinner? Print the Bride and Groom’s names/date on tracing paper and decoupage to bag, then decoupage on some floral print tissue, then add wax shavings in fruity pastel colors…a few flower shaped hole punches and you have the cheapest most amazing centerpieces ever! Note to self: Why didn’t you think of this earlier? Make a sample and post it. Sparkle Factor. Hole punches are not needed, but gosh do they make everything sparkle! If you don’t have a hole punch, just make some tiny slits or triangles or heart shapes…Look at this! My goodness, what some people can do with scissors! String them up! Take Martha’s idea and put them on a string of Christmas lights. Nifty stuff! These are so great! I loved melting crayon bits for stained glass windows, or at least thats what we called them 😉 Great fun! Wow, those are gorgeous! What a fun and pretty idea. Thanks so much for this, I’ll be linking. Oh geez… you reminded me of stuff I did in kindergarden in Germany, aeons ago. I remember the smell and the warm glow of the finished candle holder in use. Excuse me, I’m off to buy crayons. these are awesome! so creative!!! Ironed crayons are the best use for an iron:-), I have one dedicated just to ironing crayons. Well it was not intended that way but I ironed crayons a bit too enthusiastically one day, and had to buy a new iron for ironing things other than crayons, like heat setting fabric paint. However I have heard that irons are good for clothes too. *giggle giggle*…I think you are on to something! Forget the clothes, lets just iron crayons. What about ironing crayons into clothes? Hmmm….I feel a project coming on! I write about things that interest me, frustrate me, puzzle me and information that will be educational and useful to others. This is great kids activity for the holidays. Thx for sharing. Beautiful! You have a Great site! Love everything—I will be following you! Awesome! We use a lot of candles, and these look like a great idea. Am going to try this with my seniors at athe assisted living using battery operated tea lights.